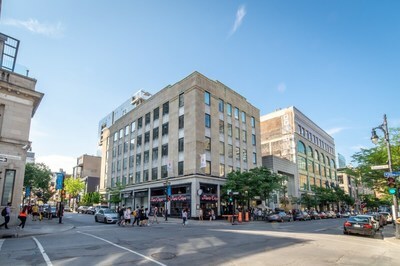 MONTRÃAL, July 12, 2018 /CNW Telbec/ – BTB Real Estate Investment Trust (TSX: BTB.UN) (“BTB” or the “Trust“) is pleased to announce the acquisition of mixed-use property (with a retail and an office component) strategically located at the corner of Sainte-Catherine and Crescent Streets, more specifically at 1327-1333 Saint-Catherine Street West and 1411 Crescent Street in MontrÃ©al. With a total leasable area of approximately 31,000 square feet, this $25.2 million acquisition, excluding transaction fees, brings to 72 the number of properties owned by the Trust. This acquisition is in line with the conclusions of BTB’s strategic review, selling its smaller properties or its properties located in smaller markets, while purchasing larger properties or properties located in larger markets in the provinces of Quebec and Ontario to maximize the Trust’s financial performance. BTB’s growth and the increase of the number of employees caused the Trust to sell its head office and in the coming fall, the Trust will relocate its operation in this recently acquired property. BTB will be an important occupant of this property, strategically located in downtown Montreal. BTB is a real estate investment trust listed on the Toronto Stock Exchange. BTB is an important owner of properties in eastern Canada. BTB now owns 72 retail, office and industrial properties for a total leasable area of more than 5.4 million square feet. BTB’s asset value is approximately $790M. The objectives of BTB are: i) to grow its revenues from its assets to increase distributable income and therefore fund distributions; (ii) to maximize the value of its assets through dynamic management of its properties in order to sustain the long-term value of its units; and (iii) to generate cash distributions that are fiscally beneficial to unitholders.